THE cause of a signalling failure at Streatham Hill in south London which caused serious disruption from Wednesday night until today has been revealed to have been a fire in control equipment. 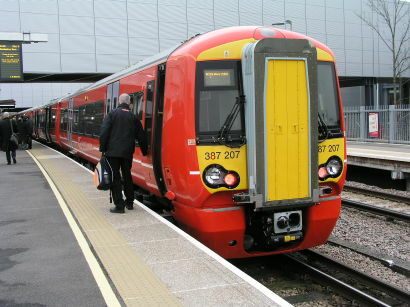 The blackout of signals for more than 24 hours mainly affected Southern and Gatwick Express services to London Victoria, but Thameslink services were also delayed, with no services running for a while on the Wimbledon/Sutton loop. The equipment at the centre of the problem was a two-year old automatic power controller, which can feed current to the signalling from either the National Grid or one of two traction current substations at Streatham and Balham. It is designed to select an alternative supply if one source fails, but the fire in the controller caused a complete loss of power by interrupting all three circuits. Chris Denham of Network Rail told Railnews that power to the signals was restored by installing manual switching as a temporary measure, while an investigation has started into the cause of the fire in the comparatively new power controller. Services were returning to normal on Friday (6 July), but National Rail warned that some trains routed through East Croydon could still be delayed until about 15.30.